Abstract—The main objective of this study was to assess the concentrations of some heavy metals of human health importance in the roadside dusts across three major locations in Monte Christo, Windhoek and compare the values with regulatory maximum permissible limits. Eighteen (18) samples of the roadside dusts (consisting of 6 each) were collected from both sides of the road at Hereford street, Fuel service station, and Traffic junction. The samples were digested using EPA method 3050B and analyzed for the heavy metals’ concentrations using Inductively Coupled Plasma-Optical Emission Spectrophotometer (ICP: Perkin Elmer Optima 7000 DV). The overall mean concentrations (mg/kg) of the heavy metals recorded across the sampling sites follow the order: Fe >Mn> Zn > Cu >Pb> Cr > Ni. Result of the analysis of variance between the mean concentrations of the heavy metals was statistically significant (Anova: single factor, p < 0.05). Although, the present concentrations of the heavy metals were generally lower than their health regulatory maximum permissible limits in soils, the enrichment factors revealed deficient to minimal (2 < EF < 5) and significant indices (5 < EF < 20). These are related to anthropogenically induced contaminations. There are strong positive correlations between the mean levels of the heavy metals which suggest common sources of anthropogenic inputs. It is therefore, recommended that the impact of the sources of metals emission on heavy metals’ accumulations in the area should be established with a view to advising precautionary measures that could minimize unintended exposure of the populace. Index Terms—Heavy metals, roadside dusts, enrichment factor, Monte Christo. S. A. Onjefu is with the Department of Natural and Applied Sciences, Namibia University of Science and Technology, Private Bag, 13388, Windhoek, Namibia (e-mail: sonjefu@nust.na). J. Abah is with the Department of Mathematics, Science and Sport Education, Faculty of Education, University of Namibia, Katima Mulilo Campus, Private Bag, 1096, Katima Mulilo Namibia (e-mail: jabah@unam.na). B. Nambundunga is with the Department of Health Sciences, Namibia University of Science and Technology, Private Bag, 13388, Windhoek, Namibia (e-mail: bnambundunga@gmail.com). 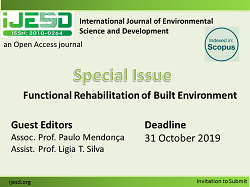 Cite: S. A. Onjefu, J. Abah, and B. Nambundunga, "Some Heavy Metals’ Concentrations in Roadside Dusts at Monte Christo, Windhoek Namibia," International Journal of Environmental Science and Development vol. 8, no. 9, pp. 647-652, 2017.